The role of the gallbladder is very important for our crucial health, as it helps us digest the food we consume, break up fats, and store bile which is produced by the liver and used for digestion. As the food travels down the digestive tract into the small intestine, it signals this small organ to secrete bile that will break it down. Liver and gallbladder congestion are very common health issues, and the most common solution is the surgical removal of the gallbladder. 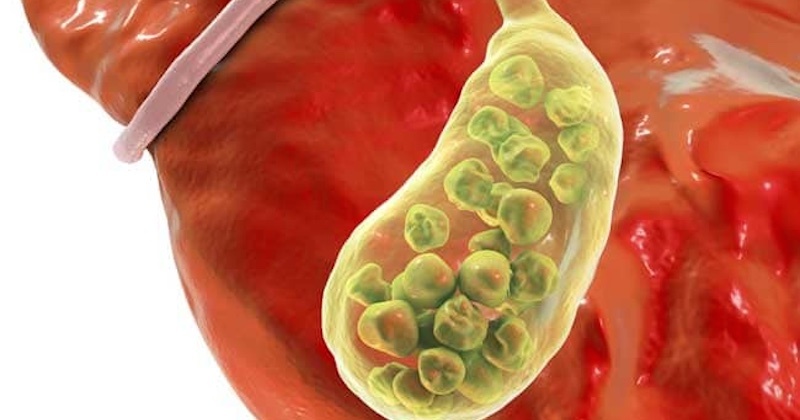 “When cholesterol and other matter within bile bind together and become more solid, they can become lodged in the inner lining of the gallbladder, growing into cholesterol gallstones over time. The exact reason that gallstones form isn’t agreed upon by most doctors or researchers. One of the leading theories is that they can form when your bile contains too much cholesterol, which can be caused by a poor diet or hormone imbalances. Usually, bile has the enzymes necessary to properly dissolve cholesterol released by your liver, but in some cases the liver might excrete more cholesterol than can be dissolved, so it builds up into solid pieces. Gallstone issues lead to symptoms like a sudden and intense pain in the abdomen, accompanied by nausea or vomiting, or a sudden, intense back pain between your shoulders. Also, in the case of a blocked bile duct, the skin can turn yellow. On the other hand, numerous diseases can be traced back to a liver issue, as this organ is responsible for the growth and functioning of every body cell. Its poor performance can lead to deficiencies, malfunction, or abnormal growth pattern of cells. Therefore, numerous health issues can be reversed by doing a liver and gallbladder cleanse, and you will restore the vitality and health. “A gallbladder cleanse — also called a gallbladder flush or a liver flush — is an alternative remedy for ridding the body of gallstones. Proponents of gallbladder cleansing claim that the treatment helps break up gallstones and stimulates the gallbladder to release them in the stool. The large, repeated doses of olive oil in gallbladder cleanse preparations do have a laxative effect. In case you have been diagnosed with gallbladder stones, you can promote relief and treat the discomfort in a natural way. There are effective herbs that can help you maintain balance, and the use of a “stone breakers” can be of help in the case of pain. “A gallbladder attack or gallstone attack is also called biliary colic and refers to when pain strikes in the abdomen area (often upper right part). Biliary colic happens due to a gallstone temporarily blocking the bile duct. Pain may radiate to the shoulder and may last for an hour or longer. Gallbladder flushes can be highly beneficial as soon as you are feeling better, and in cases you have removed the gallbladder. Before performing a gallbladder cleanse do a digestive cleanse first to clean the bowels in order to ease the elimination of stones. Here are all the needed instructions to do the gallbladder cleanse protocol that will take about a week. Drink at least 1 liter of freshly-extracted apple juice for 6 days prior to cleanse day, as the malic acid will soften the gallbladder stones. Drink the juice half an hour before meals or 2 hours after meals. Avoid dairy and follow a low-fat diet, rich in veggies and vegetables. Avoid cold and chilled foods and drinks. You need to plan to stay at home this day, as you will need to rest, and frequently visit the bathroom. Drink the 32 ounces of apple juice by noon, eat a small, light breakfast, and avoid dairy, sugar, animal protein, and fats. Eat nothing during the rest of the day, but drink plenty of water. 8.00 pm: Drink your second serving. 9.45 pm: In an empty clean jar, add the olive oil and grapefruit juice close and shake the jar, and get a 6-oz glass of the Epsom salt water on your bedside table for the next morning. 10.00 pm: Drink the juice-olive oil mixture without stopping, while standing up. Remain still for at least 20 minutes, and go to bed. If you feel the urge to purge during the night, do so. Use a colander and collect the small gallstones to count them. You may feel nauseated during the night or early in the morning, but it will pass soon. 6.30 am: Drink your third 6-oz serving of the Epsom salt water, while in an upright position. 8.30 am: Drink your last serving of the 6-oz serving of the Epsom salt water, and as much freshly extracted juices as you wish. Drink water, and eat some fruits. Your meals should be light during the next few days. During the cleanse, your bowel movements might be watery, and will purge out small greenish pea-sized stones in your stool. The darkest stones are the oldest. You might get rid of many tiny, white sharp-edged cholesterol crystals that could grow in the gallbladder and lead to severe problems. You might eliminate fewer stones during the first cleanse, but your symptoms and your condition will improve. In case you feel some discomfort within the next few days or weeks, the stones deep in the gallbladder are ready to be eliminated with your next round of cleansing. You should repeat the cleanse every month, and most people need to perform it about 5-6 times. Yet, note that once you have started the cleanse, you mustn’t leave the gallbladder without further cleanse, as it may cause even greater discomfort than before. Remember to drink plenty of water during the cleanse, lower the fat intake, and increase the intake of fiber, through veggies, fruits, and whole grains. A gallbladder flush is not recommended for people who have recently had a surgery, women while menstruating, individuals under 18, and women who are pregnant or nursing.